Congratulations to the Doric Bar! The Doric Bar, Market Street was presented with the 2016 Branch Real Ale Quality Award on January 19th. 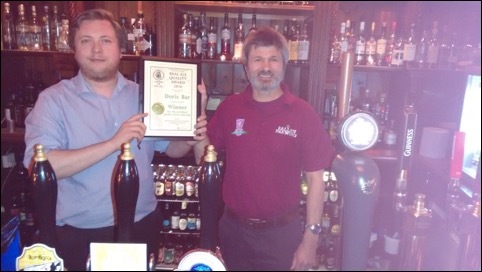 The Real Ale Quality Award certificate being presented to the Doric by Jon Addinall, Branch Pubs Officer. The overall winner was the Doric Bar. A presentation at the Doric will be held at 6:30pm on January 19th.